Tyndale House Publishers is releasing Small is Big! : Unleashing the big impact of intentionally small churches today. This is essentially an updated, paperback version of our book The Rabbit and the Elephant, but contains two totally new chapters on what is happening with mega- and legacy churches too. Many of these larger churches are working with those of us in simple/organic church and using the principles of simple/organic churches to reach out to the communities around them. The book is available via Amazon, (who are still linking the contents to the original hardback version although this is due to change soon). You can see it here. "Church planters Tony and Felicity Dale and acclaimed researcher George Barna bring a big message to God’s church. How might we change the world if our Christian faith began multiplying at a rapid pace—through a way of life that is explosive and transformational? It happened once before, in the early days of the church; what will it take to bring us to that point of urgency and determination again? 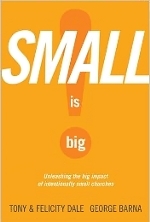 Small Is Big (originally published as The Rabbit and the Elephant) offers keys to 21st-century evangelism: leveraging the power of the small—and taking the gospel to where the people are and the pain is. And as God uses us to channel Jesus’ love into a hurting, desperate world, we’ll see his church grow beyond anything we could have imagined." We would love your help to get out the word about this new edition of the book. You will be doing us a big favor if you tweet and pass on this message via Facebook and other social media sites.